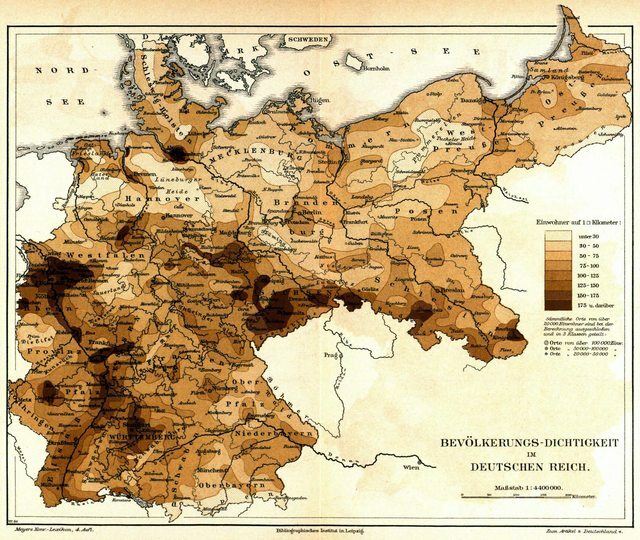 The Prussian province of Silesia was split in two "halves", the northwest, centered around Breslau (Wrocław), was mostly Protestant, German-speaking, and was akin to other regions of the kingdom of Prussia. The southeast, centered around Oppeln (Opole) however was very different as its inhabitants were very devout Catholics and mostly spoke a variety of Polish language. The reason why the linguistic and religious borders overlap is quite simple: as the Prussian authorities tried to ban the Polish language and replace it with German, Protestants believers welcomed this move as a sign of economical progress and didn't resist the change, while Catholics saw this as aggression against their identity and actively resisted the change - and Catholic religious education was the only public place outside home where kid could learn the Polish language, which was banned from schools. 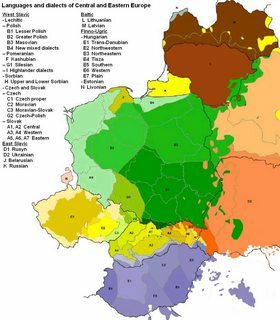 While the vast majority of the Silesian population could be fit in either the "Protestant German from Lower Silesia" or the "Catholic Pole from Upper Silesia" cliches, the linguistic and religious border actually didn't overlap as much as we'd expect. The linguistic border was more or less on a North/South axis between Namslau (Namysłów) and Neustadt (Prudnik). On the other side the religious border was an West/East axis between Neurode (Nowa Ruda) and Kreuzburg (Kluczbork). This means there existed a triangle where the population was predominantly German and Catholic arround Glatz (Kłodzko) and Neisse (Nysa). There also existed a region which was predominately Protestant and Polish speaking around Kreuzburg (Kluczbork), and this city is even today one of the very few cities in Poland where the major church at "Rynek" marketplace is a Protestant church. I am well aware that those maps mostly represent rural areas. Urban areas, including even small towns, were growing quickly and were inhabited by people who came from various areas of the country to work, so they were always multicultural religiously and when applicable, linguistically. On the other hand rural areas which made most of the land were mostly inhabited by people who are from here since a long time and the population is typically not growing much, so they are much less subject to change their linguistic and/or religious traditions. My question is: How did those two "excentric" areas come into existence? Why didn't Catholics around Glatz and Neisse resist Germanisation like the other upper Silesians did? 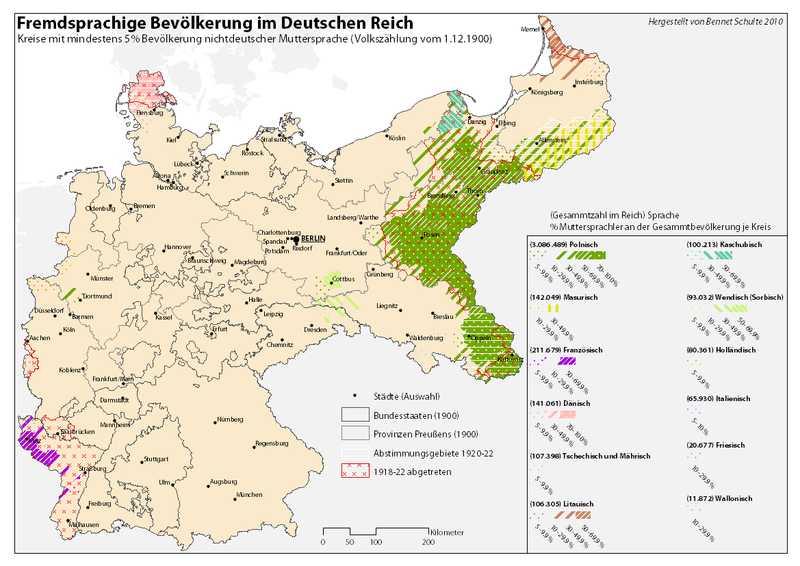 And why did the Protestants around Kreuzburg continue to speak Polish when all the other Protestants in the province switched to German in the 19th century? The maps are simplifications for a very complicated setup. As such they are misleading in several ways. Spatially they represent large swathes of land with a limited number of gradients to ease identifications of majorities. Which inhabitants are located where is necessarily less precise than the situation on the ground. Temporally these maps show just one point in time for a very dynamic region of mixing, moving intermingling people within and around borders that changed over time. These maps are representations of the authorities, especially the second one. They do not reflect how people feel or acted, but how they were counted. Population density in cities is much higher than in the surrounding rural areas but that is not displayable in a map of this density. First of all it is necessary to clarify that neither "Polish" nor "German" had as much meaning carrying than those words imply to us today when we look at the history of that region. And that description and analysis history has to start at least during the middle ages when "Germans" settled in that region and with the reformation splitting the unified Christian church into two factions (at least). People moved around as much as they could and as they saw fit to make a living, sometimes assimilating into their surroundings sometimes starting to dominate the previous inhabitants and changing their ways and language. When protestantism started to spread it was a fad of consciousness and conviction regardless of heritage and language and it was very much fostered by smaller dukes and counts and whoever was "in charge of a territory", mainly as he saw fit to oppose the central power of the emperor or to just plunder Catholic possessions. We know that this constellation lead to the Thirty Years War and ended with the principles of tolerance between Protestants and Catholics and cuius regio eius religio ('the regent's religion is the principle religion of the region'), however small such a regency was. Both principles followed much more closely than when originally proclaimed in 1555 and religion no longer an official reason for a great war. That means quite a lot of people's movement, conversions, border changes, changes of authority, war, destruction, killings and resettlements. In the last 1000 years, to behold. Take just the County of Glatz (Kłodzko): becoming German enough for a German name in 1223, not part of Silesia but Bohemia, during the Reformation a centre of Protestant sects, opposing the emperor and when invaded had 930 of then 1300 buildings destroyed. All members or sympathiser of that sect were severly punished. Then the city was struck heavily by the plague in 1635 and 1680. During the Silesian wars Prussia invaded and annexed it and made it finally part of Prussian province Silesia in 1808. That "the authorities" tried very much to change everything in that county to their liking is a story of centuries. Nothing of this long dynamic is meaningfully reflected in the maps above. In short that region was never really uniform nor unified, contrary to what the maps suggest even in their colourfulness. While most of the general trends and descriptions for the processes outlined in the question (e.g. Protestants being more welcoming of the changes brought on by Prussian authorities) are not "incorrect", they are at the same time simplifications as well. Compare that linguistic description from the question to the one outlier, the single line West of Dortmund in the linguistic map from the question. It represents the "Polish" inhabitants of the Rhineland, the Ruhrpoles. How would you describe the dynamics surroundings them? Did they assimilate, did they "resist", left on their own accord or were they driven off? It is an uneasy task to find an all-encompassing term that is at the same time precise. There have been some debates on whether or not the Silesians (historically, Upper Silesians) constitute a distinct nation. In modern history, they have often been pressured to declare themselves to be German, Polish or Czech, and use the language of the nation [that, sic!] was in control of Silesia. 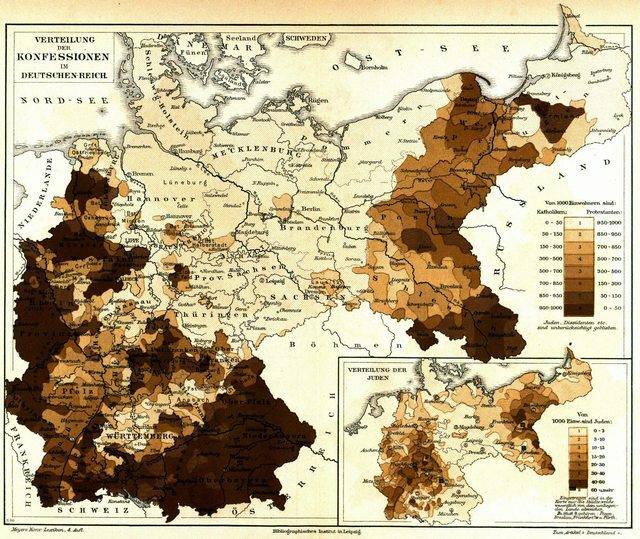 The earliest exact census figures on ethnolinguistic or national structure (Nationalverschiedenheit) of the Prussian part of Upper Silesia, come from year 1819. The last pre-WW1 general census figures available, are from 1910 (if not including the 1911 census of school children - Sprachzählung unter den Schulkindern - which revealed a higher percent of Polish-speakers among school children than the 1910 census among the general populace). 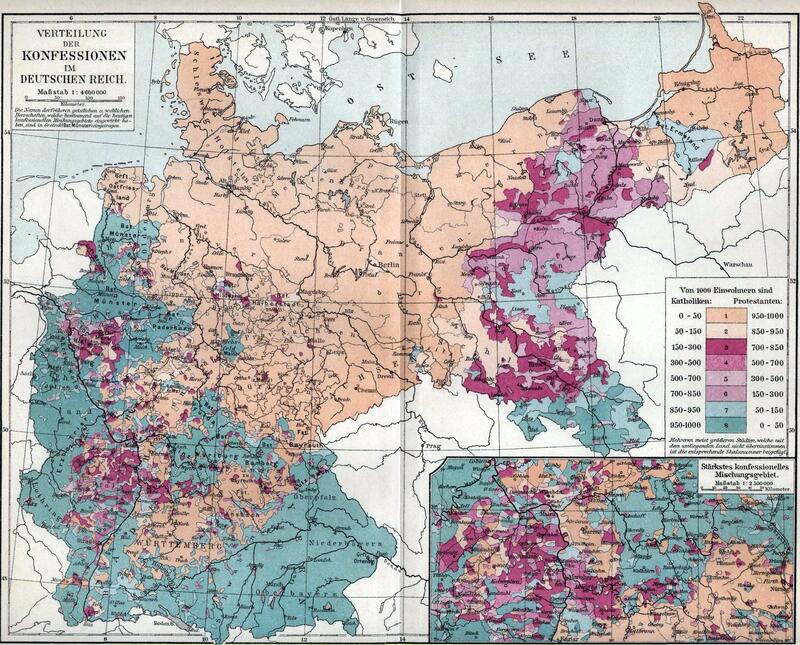 Figures show that large demographic changes took place between 1819 and 1910, with the region's total population quadrupling, the percent of German-speakers increasing significantly, and that of Polish-speakers declining considerably. Also the total land area in which Polish language was spoken, as well as the land area in which it was spoken by the majority, declined between 1790 and 1890. Turning the initial argument on its head, we might also ask "why do some Upper Silesians still resist polonisation of their language, now"? Not the answer you're looking for? Browse other questions tagged religion language imperial-germany silesia or ask your own question.